The tract used by Witnesses to invite the public to attend their memorial. 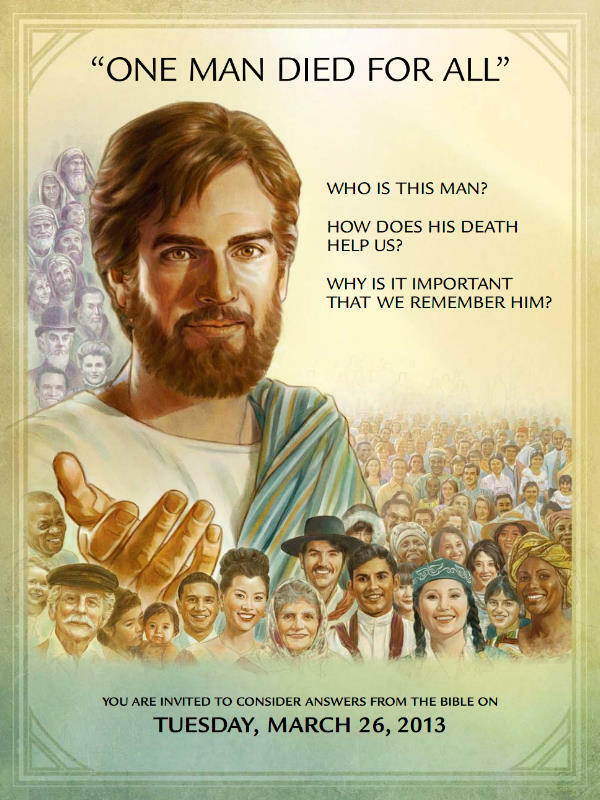 Jehovah’s Witnesses are again doing their tract campaign (downloadable at JW.org) to invite everyone to the “most important day of the year”, the memorial of Christ’s death. They are covering their territories as fast as they possibly can, in an effort to get a flyer into everyone’s hand or door. It has only been in the last 10 years or so (that’s an estimate!) that the Watchtower has decided that everyone is invited. Prior to this the friends were instructed to be careful who they invited, and that a Bible student could be invited but you should explain to them first why so few partake of the emblems, etc. The general public was certainly not invited as is the case today. Lent is a solemn observance in the liturgical year of many Christian denominations, lasting for a period of approximately six weeks leading up to Easter Sunday. The traditional purpose of Lent is the preparation of the believer—through prayer, penance, repentance, almsgiving, and self-denial. Its institutional purpose is heightened in the annual commemoration of Holy Week, marking the death and resurrection of Jesus, which recalls the events of the the Bible when Jesus is crucified on Good Friday, which then culminates in the celebration on Easter Sunday of the Resurrection of Jesus Christ. During Lent, many of the faithful commit to fasting or giving up certain types of luxuries as a form of penitence. The Stations of the Cross, a devotional commemoration of Christ’s carrying the Cross and of his execution, are often observed… In certain pious Catholic countries, some adherents mark the season with the traditional abstention from the consumption of meat. Since this will be celebrated by Jehovah’s Witnesses in a couple weeks on March 26th 2013, it seems appropriate to discuss this important time of year as fellow Strugglers. We have written one or more articles about this event each year since the blog has been up and running during memorial season. (Greybeard wrote about it last year here. I wrote about Memorial in 2011 here. I appreciated your latest letter. As you have found, the Memorial, as celebrated by Witnesses, converts an expression of faith (in Christ’s ransom sacrifice on the part of all Christians) into a means primarily for advancing an organization’s teaching and restricting Jesus’ words, “Do this [that is, take of the wine and unleavened bread] in remembrance of me” to a comparatively tiny group of persons. If one reads John 6:32-59 it seems quite clear that bread and wine are used Biblically to symbolize things in which everyone hoping to gain life must share, that both emblems refer to the ransom sacrifice, God’s provision through Christ for attaining life everlasting made available for all persons. By his later use of these emblems at the final supper, God’s Son established a means for expressing through figurative emblems the faith each of us has in the ransom sacrifice he provided, as well making acknowledgment of the community of brotherhood we hold with all others having that faith. So, in our discussions we focus on the fact that Christ instituted the occasion as a means for remembering him and for expressing faith in his ransom sacrifice. He said nothing about two classes, one class partaking and the other not. (Compare 1 Corinthians 11:23-26; John 6:47-58) Paul’s words about partaking “unworthily” had to do with the manner and attitude some in Corinth were showing on the occasion and did not in anyway indicate that participation was restricted to a particular “class” of Christians. (1 Corinthians 11:17-22, 27-34) Recognizing that eating the bread and drinking the wine simply represents faith in the ransom sacrifice Christ provided, from which all Christians benefit, almost all in attendance at our gatherings usually partake. It is so much more meaningful than the rather empty ceremony typical of Kingdom Hall celebrations. In our celebration, we gather in the evening for a regular meal and then follow this with a commemorating of the Lord’s evening meal, which we generally do while still sitting around the dinner table. It is informal but enjoyable and meaningful. I think of the fact that even the Passover was not celebrated at the temple (though each family’s lamb was sacrificed there) but was held in homes, something that was true of early Christian’s commemorating of the Lord’s evening meal. The simplicity, accessibility, and every-day nature of the emblems Christ employed also seem notable. They had nothing of the unusual or exotic or “special,” since they were common items on the daily table, not some kind of special “sabbath” food. Similarly Christ’s ransom sacrifice is open to all, and our partaking of his “body” and “blood” is not something done on Sundays but an everyday, all-day matter, carried out by showing faith in our ordinary, daily affairs of life. As regards the time for celebrating the Lord’s evening meal, we have customarily celebrated the meal on the date of the Jewish passover, but not as viewing that as a require date. It would seem that the important thing is the celebrating of the meal, not the precise day. We really have no way of knowing what day Jesus would recognize today as the “correct” date corresponding to Passover. Actually, there really is not much Biblical proof that Christians celebrated it only on a yearly basis. The apostle Paul quotes Jesus as saying, “Keep doing this, as often as you drink it, in remembrance of me.” (1 Corinthians 11:25) As a Witness, I used to try to explain away the expression “often” by referring to Hebrews 9:25, where the word “often” appears again in the English New World Translation, used there in connection with the high priest’s entry into the Most Holy, which took place once a year on atonement day. But a person familiar with Greek pointed out to me that in the Greek original two different words are used for the “often” in 1 Corinthians and that at Hebrews 9. The one in Hebrews 9 means essentially “a number of times” but that in 1 Corinthians is much more indefinite (or broader and looser), and has the sense of “whenever.” He also pointed out that it is generally believed that Paul arrived first in Corinth about 50 A.D. and the account in Acts shows he spent a minimum of eighteen months there (Acts 18:11), possibly longer (Acts 18:18), so he left there in late 51 or early 52 A.D. His first letter to Corinthians is believed to have been written about the spring of 55 A.D. In that letter he rebukes them for their conduct in connection with the Lord’s evening meal (chapter 11:17-22), showing that some were viewing it as if it were an ordinary meal and giving no true significance to the emblems. If the celebration of the meal was done only once a year it seems incredible that, after having celebrated it only four or five times at the most (from 50 to 55 A.D.), and perhaps only three times since Paul’s departure, they could possibly slip so quickly into such an attitude. A once-a-year celebration would have made the event an unusual, uncommon one. On the other hand if they were celebrating it not on an annual basis but more often, they might have celebrated it dozens or scores of times in those few years. That would more reasonably explain how some had come to take the attitude that Paul rebukes. Some suggest that when Christians had their agapes or gatherings of fellowship that they kept the Lord’s evening meal along with their regular meal. Nothing dogmatic can be stated. I can see why persons who are gathering together at some other time of the year and who may not be seeing each other for some time (perhaps coming from different, even distant, locations) might wish to celebrate the meal at such occasion. (When I was in Germany two years ago, three brothers were there from Sweden (including Carl Olof Jonsson) and they expressed the wish to share in the Lord’s evening meal with me. We did that in my hotel room. I do think there is some validity at least to a view expressed that for a time after a major event takes place, the memory of the event itself is vivid. As time goes on, it is the effect of the event that is more enduring. I am sure that in the years following Jesus’ crucifixion and death the celebrating of the Lord’s evening meal had a special poignancy, the memory of what had transpired being yet fresh in their minds, the intense attitudes that produced the execution of their Lord still surrounding them and felt very acutely. Though those basic attitudes exist today, and the gravity of the historical act has never diminished, I think that it is true that today we think more of the effects of what he accomplished by his death. It is true that the Memorial celebration focuses on those effects. But I can see that people back then might feel a greater or more intense motivation for holding that celebration with perhaps some degree of frequency than might be true now. Those are just thoughts, for whatever they are worth. I am sure you appreciate the need for patience during a time of transition. I feel that there is no experience that cannot bring some benefit, if we’re willing to work to that end. Some of those experiences we characterize as negative and unpleasant can often teach more than those we view as pleasurable. At the same time that does not excuse from responsibility those who contributed to our making decisions that we would probably not have made had we not been misinformed. It was probably the rather cavalier, insensitive spirit so often manifest in Governing Body discussions that most disturbed me. Life has its seasons and each difficult season that we weather strengthens us for the future. Life is also a journey and we cannot make progress in it if our focus is mainly on where we have been; that could lead to emotional inertia or even entropy. What is done is done. The journey inevitably contains challenge, but we can find encouragement in knowing that we are moving on, making at least some progress, and can feel confident that what is ahead can be fulfilling. Hope that things may go well for you. Brother Franz was just a man, no better than the rest of us in God’s sight. But he undoubtedly is one of the most intelligent and educated Bible scholars to ever come out of the Watchtower movement and so it is for this reason that his Biblically-based commentary interests us as truth-seekers. What will you be doing on March 26th this year? Will you attend the Memorial at a Kingdom Hall of Jehovah’s Witnesses? Will you partake of the emblems afterward privately, as many thousands of other sincere Witnesses each year do? Or will you celebrate on another day altogether? I will partake at the KH. I agree with CM that all persons may accept the forgiveness and life offered via christ’s death if they want it, and the memorial of Christ death is an opportunity to show appriciation. I am planning to partake in the privacy of my own home. This will be a first. DM: If you go to the store and get matzo that should be sufficient. Matzo is unleavened. and reside there for the 1000yrs. Russell took it a step further teaching that there were 2 heavenly classes 144,000 & great crowd. Rutherford seperated the two into an earthly/heavenly. From that point forward,all kinds of confusion,and greater error ensued. Heres what you’re not as a member of the “great crowd of others sheep” let’s stop right there if you have to conjugate words to prove a point rather than letting the bible explain itself that should raise red flags. “Spiritual Israel” not scriptural either. Doctrinally here’s what the G.C. is not. e. not part of Christ’s body. h. not spiritual brother of Christ. q. not a chosen one. Interesting comments Andre and Chris. Do either of you have connections to the COGAF or Restoration Fellowship? Can you recommend any good books (in addition to the Bible of course) about the commonly held heavenly belief actually being Earthly? That’s the crux of the matter and excellent observation Andre. Those who rule with Christ, rule over the Earth as part of a restoration government. That is the whole purpose of the heavenly calling. I think I will partake at home. I say ” think ” because I am wavering as to whether or not it is necessary. I know that sounds strange, so let me explain. I had quite the discussion with a Christian man who is a pterist. So I am a little confused over the issue at this point. I don’t feel that it is wrong, but is it really still needed? I am sure that I will partake at home this year. I am just a bit confused right now. I need to do some more research. So make up my mind for me! LOL!! Good for you Spike. Following Christ’s command makes us children of God. Many thousands of Witnesses will do so along with hundreds of millions of Christians from other denominations. It’s ironic that we preach,following the admonition given at (Mt 28:19,20) “teaching them ALL the things I have commanded YOU! 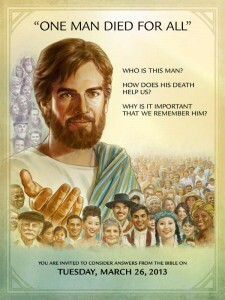 Who was he speaking to, no doubt his faithful Apostles among others. What the Apostles do, we do. They didn’t show up to touch a glass, and plate. Historically the Hebrews, would have found our practice of inviting millions of people to a meal as passive observers, to be quite odd if not greatly inhospitable! When we’re baptized, that is a happy yet a hubling experience, or at least it should be. We are sacrificing our “Adamic” self into the water or death, to be reborn a new person in Christ. We’re now reconciled children of God. Going through those physical motions demonstrates our acknowledgement that our flawed Adamic self needs redemption from a source outside of ourselves. Partaking of the emblems is directly connected with this process. Some witnesses from my hall came by and gave me a memorial invitation. I have a good notion to mail it back to the KH with Ray’s informative information folded up inside of it as well as the numbers of the memorial partakers from the past few years showing the numbering increase and also quotes from various Watchtowers pointing out that a key point to the end of this wicked system is the number of anointed persons would decrease. Orwell i was depressed and had a drinking problem when i woke up to TTATT i got much better I too am partaking at home lol i don’t wanna embarass my family though i dont like wine very much, neways i know how you feel and rest assure that there are many more like you and so is God. Wakeupwitness that would be hilarious, sad all they would do is consider it evil and throw it in the trash followed by a good habdwash lol, it would b a waste of ink n paper n time but u get an A plus for effort. Gods timing is so different from our timing. Hope this helps us all to be patient as we endure our trials. For everything there is a season, a time for every activity under heaven. None of his little shepp will be lost. God is the source of all life (Num. 16:22). He makes everything perfect in its season. And we know that God causes everything to work together for the good of those who love God and are called according to his purpose for them (Rom. 8:28). Solomon writes later in chapter 3 that God has planted eternity in the human heart. Eternity cannot be found in life’s cycles. The secret to peace with God is to determine, accept, and value God’s perfect timing. We have to keep turning back to him. To doubt God’s timing is to move ahead without his advice. All things apart from God are empty and pointless. Solomon affirms the value of knowledge, relationships, work, and pleasure, but only in their proper place. No joy or contentment is possible without God. We should strive to know and love God. He is the giver of wisdom, knowledge, and joy. Every moment and every season is another opportunity to turn, turn, turn back to him. Another great irony of WT doctrine regarding the two class theology. They often talk about how there were “good” people outside the ark, who may have even played a role in it’s construction, yet their decision not to enter ended their lives. To escape God’s wrath &and gain life in the age to come one must get into the antitypical ark the Christ. The literal ark was made of a “resinous wood” and was covered inside &and out with “bitumen” or oil, the word “christ” is a greek translation of the hebrew “messiah” which would be pronounced meshiach which simply means to be smeared with oil. The oil that covered the ark would have kept all who took refuge in it completely protected from the water or wrath of god. Similarly the spirit anointing that Christ recieved at his baptism empowered him to play that vital role toward all that would take refuge IN him. (Ps 2:12) “Kiss the son, that He may not become incensed, And you may not perish from the way, For his anger flares up easily. Happy are all those taking refuge IN HIM. (1 Cor 15:22) For just as IN Adam all are dying, so also IN the Christ all will be made alive. I said it before upon a proper baptism when one is baptised they spiritually exit Adam and enter the Christ, spiritually. When Christ actually returns all IN Christ wether living or not we will all be changed (1 Cor 15:52) to have a new body w/o the curse that we all carry now. PLEASE pay attention to this next point! (Luke 24:30,31) “And as he was reclining with them at the MEAL he took the loaf, blessed it, broke it and began to hand it to them. 31 At that their eyes were FULLY OPENED!! and they recognized him; and he disappeared from them.” When you partake you’re acknowledging the saving power of Christ’s body and are thus rewarded by becoming a part of it, and yes you become “anointed”. I fully understand the stand many of you’ve taken, we must all follow our conscience. I believe that Christ is the stone that will destroy all Goliath like opposers to his will including the false prophets misleading our brothers. There’s nothing wrong with being organized, there’s something wrong with being organizationalized, to become pyramidal rather than familial! Please don’t condemn the sheep, they’re good people for the most part who do have some key truths correct, yet are being held hostage by these wicked men. Let’s all pray that we can fulfill our Christian obligations, as Christians and not as the world. Not attacking one another. Not wasting our time bashing the org. we get it they’re a mess, now what? Let’s do something positive,and scripturally legitimate. Great scriptural reasoning Andre thank you. Your choice to stay within the organization will not be criticized by me. It is your conscience and if you feel that you can help work for positive change from within then that may be your calling. Hopefully you can wake up more brothers and sisters to the truth about the truth! I am so glad you too have awakened Andre and fell free to express yourself freely here we are not here to judge anybody neither are we trying to stop anyone from going to the meetings I agree with you that there are so many good brothers and sisters in the organization including some elders whom have not DFed anybody in years and show Mercy and love to the Flock. If only change were to happen on a grander scale in the organization many of us would gladly still want to be a part of it. I too am still active though fading little by little and tell my friends to study the bible Jah has provided many opportunities for me to speak and share some information or food for thought with them. Thank you for sharing what you have learned and feel. What a beautiful post Andre! (regarding encouraging others to have a personal bible study) Thank you! It is so encouraging to hear that the sheep are being encouraged in their own personal bible study. It is by this means that we come to know God and His will for us, for His spirit is in His word, and we are led by means of Spirit. This then opens our eyes, then we come to know that Christ died for ALL mankind, and that by faith in His sacrifice, we are declared righteous in His sight. Keep up the good work please! May Jehovah bless you and keep you safe. Are you Andre from the Awake! magazine! LOL!!! Thanks for the encouraging words! I will be reading them again when I have more time. This week is going to be stressful for me. I want to go into hiding and just be left alone by everyone. Thank you so much brothers & sisters!! Going to meetings for me now is painful to say the least!! I am working on a book entitled ” Knowing our Place” the Christian relationship to the Father the Son & the Holy spirit. I had a thought, if you are someone with doubts and are married. DO NOT push your new found beliefs upon your mate. Recognize that in many ways they like most of us were devout literature students, I’ll speak for myself only,yet extremely poor students of the bible. during your “family study night” read the Bible with your family. Pray for holy spirit, teach your family to reason using interbiblical context, rather than ecclesiastical,(FDS) guided thinking. What I believe often happens is you’re now speaking in and thinking in a newfound language, which in many ways is foreign to,scary to,and threatening to say the least, to your mates. As likely it once was to you?! If you can patiently,work for & toward their spiritual growth allowing the Bible to do what we fully trust it can. (2 Tim 3:16,17) (Heb 4:12,13) You may be surprised and even inspired by the power the scriptures can have on your loved ones (2 Cor 10:4) “For the weapons of our warfare are not fleshly but powerful by God for overturning strongly entrenched things.” Don’t force it let the bible do the cutting like the sharp blade it is,cutting out error from truth. The WT uses the term Christendom, and contrasts itself with it. Characterizing “christendom” as a giant monolithic trinitarian, immortal soul teaching entity that the Org. is the antithesis to. Indeed we do have some excellent truths,that we promote. (Unitarian God,the Father, soul sleep/as opposed to inherent immortality)yet we’re not the only one’s posessing these truths. A growing body of Christians who are leaving orthodoxy as they’ve seen that in many ways it fails to live up to it’s high calling have formed small bible study groups. Many are finding the precious truths in scripture themselves. (Rev 2:17) “To him that conquers I will give some of the hidden manna” in the ark of the covenant their was a jar holding manna within it. Of course the ark represents Christ, he as our teacher and high priest will reveal truth to whomever he chooses to. In ancient Israel, the prophets who stood for the truth often had to run and hide. That did’nt make them fools it made them pragmatic! Please keep studying your bibles, pray for discernment,understanding, and faith. God willing in our lifetimes the spiritual walls of Jericho will fall and we’ll truly be in a spiritual paradise,serving shoulder to shoulder as I believe many of you,wish you could justify doing now. It’s wonderful to be united, to be part of something international, which should be a model of the new world society. Yet until things are cleaned up,to a reasonable degree,please keep each other out there encouraged with scripture and with upbuilding experiences. There’s way more than enough hateful, bitter bile flowing in cyberspace!! Thank you so much brothers & sisters! !Going to meetings for me now is painful to say the least!! I am working on a book entitled” Knowing our Place” the Christian relationship to the Father the Son & the Holy spirit. I had a thought, if you are someone with doubts and are married. DO NOT push your new found beliefs upon your mate. Recognize that in many ways they like most of us were devout literature students, I’ll speak for myself only,yet extremely poor students of the bible. (Rev 2:17) “To him that conquers I will give some of the hidden manna”in the ark of the covenant their was a jar holding manna within it. Of course the ark represents Christ, he as our teacher and high priest will reveal truth to whomever he chooses to. You speak truth! Your suggestions about studying the scriptures and asking for Jah’s spirit really works, because I have been doing that for years now, the scriptures truly cut away error. Now that I am no longer under the shadow of the legalistic WTBTS , the light of the truth shines through, and the thing that causes desolation will fall. There will be a great in-gathering of truth seekers, but first it must get very dark, so the only light we see is Jehovah’s. Carry on in the spirit, brother! Very encouraging & truthful words yourself brother!! Funny you mention the legalism. It’s a system they’ve established that spirals downward. You have a group of brothers who’ve idolized power, they’ve disregarded Christ’s warning to watch out for the leaven of the Pharisees & the leaven of Herod. To maintain an almost parental relationship over their brothers, they must legalize their guidance. If they promoted the spirit of the Law, they’d have very little that they could institutionalize,weigh,measure and control. Yet you yourself are one, just like me. Who was likely burned in one way or another, by this unloving,legalism which treats people as if they’re things. Elders are often reduced to spiritual cops. CO’s are often like lieutenants,mindlessly & efficiently following the orders from their handlers in NY. Here’s the process that ends up shooting them in the foot. 1. Enforced legalism 2. Motive for victim to understand why. 3. Victim can’t talk to elders or other sheep.Often looks online to vent or for answers. 4. Becomes Bible student who is A. disident, B.Faded C. Opposer. The discontent is growing. 2014 will be an interesting year psychologically?! I’m encouraged by the moderate & balanced views that good brothers like yourself have obviously maintained, even after your once held paradigm was shifted. Hi i used to be a JW some time ago. i Love Yeshua and Yahweh with all my heart. I will be taking the bread and wine, as our lord and savior Yeshua (Jesus) says do this in remembrance of me, and his covenant of his laying his life down for us and pouring our of his blood for us, and nothing about going to heaven or not going to heaven. anyway that is for another discussion. another thing to know that satanists have a ritual where they take the last supper of Yeshua (Jesus) and just pass the the bread and wine around and no one drink or eats of it, as they are passing up the new covenant of Yeshua (Jesus) is blood that he shed for us to be saved. Welcome Brother Gary. Good for you to love the Father and the Son and not some man-made hierarchy as we once did. This memorial season is about our one hope (Eph 4:4) not about servitude to men! Thank You Brother Gary Jones for sharing your thoughts I think many of us who have awakened will be partaking for the most part during this memorial season, I know I am, because now we know that his sacrifice was for all of our forgiveness and salvation it just makes no sense to look at it and not partake. for some reason my post got lost or maybe i failed to post it. may i ask if there’s anyway to track all posts under my username? just curious…. this article is such an eye opener. i have read tons of comments and articles even some are written by professing anointed about everyone/all being required to partake but i have never thought about the point Ray Franz presented here with the lord’s supper possibly being commemorated several times a year..it’s amazing because to me the quoted verse from the Corinthians make sense, considering the “50-55 AD ” span….its enlightening. about partaking i am really not sure yet. the jw teaching about the emblems is just so engraved in my mind..although my mother told me this was the case before 1935..
u know sometimes i feel like flying to the US to be with people like you here….as i still think i’m the only struggler in this country. Just get some red wine and some crackers, or rice cakes, and read the accounts, pray over the emblems and go for it. If you can’t or you are not sure that is okay too. What if you were in a prison with no access to a bible or wine or bread? Christ would still know your heart, right? What will I be doing? Well, since the day of Passover / Memorial is fixed in reference to seasonal (March equinox) and astronomical events (full moon), I will celebrating those. Not sure if I will include Cakes & Ale in my ritual. Which brings me to a question: are JWs down under celebrating now because there, it’s fall. I am just going to stay home and take it easy the night of the Memorial. I haven’t gone to one of those in 19 years, with the last one being in 1994 when I was still following the JW’s. I dropped out shortly thereafter in August of 1994. For 17 years, I didn’t practice anything spiritual until I returned to the church that I abandoned for the JW’s in 1992. I am now happier as a result of that and I am now really satisfied with where I am at spiritually and I have been happier as a result. I will be busy during the last week of Lent. I will be attending the Wednesday night and Good Friday evening services at my church and I will also be attending the Easter Sunday service as well. Since being reinstated as a member of my old church, I have been sharing in Holy Communion with my fellow worshipers and every time that I share in that, I feel spiritually whole, which is something that I never felt as a follower of the JW cult, though I never let on to them that I didn’t feel whole spiritually as I would have been risking severe criticisms and other consequences from the hierarchy as a result of that. Thanks for this website and please keep up the great work that you’re doing. I decided that besides partaking in the privacy of my home in the emblems of christ’s memorial, I am also going to a Jewish Passover for the experience of doing something different. I might get some insights on the original passover. Oh ya, just to let you know, I am a sister, and I think it’s funny that others thought I was a dude. I guess I write and think Like a guy. Thank you for the kind words, I thank you for your sharing & apparently caring for the friends! I believe I recall you saying that you’re part of a bible study group? If so I applaud you! We can’t afford to take our “talents” I do mean that primarily in the illustrative way that Christ used it. And bury them. We can react in many ways to the discouraging elements present within not only the cong. of JW’s but in most congregations of people claiming to represent Christ & the Most high God. It’s truly astounding at how few students of the bible there are in any arena! Is it laziness,apathy,disbelief? God only knows! But the message that Christ proclaimed for the 3.5 years prior to his death, was of the kingdom. Satan is an ardent adversary of that particular message. Because that particular message that Christ taught us to pray for at (Mt 6:9,10) bridges the gap between man in his current lost state, & the purpose for which not only we but all creation was brought into existence for. Scientist’s currently estimate the universe to be 13.8 billion years old. Alot of work went into the pysyical universe’s existence for which mankind,the only sentient physical being is it’s crowning jewel. Please enjoy the Lords evening meal!!!! I have the deepest respect for all the brave souls, that have followed their conscience & publicly partaken at the annual,commemoration the the Lords evening meal!! A very interesting detail that I noticed. In 1935 Joe Rutherford introduced an unprecedented,unscriptural, doctrine among others that he introduced. That divided Christ’s congregation into a ruling aristocracy under the guise of the 144,000 with of course a ruling oligarchy, body of governors to rule within the midst of this FDS class. Then all “anointed” christians were of this class. Of course now the body of governors alone makes up this “class”. From 1935 to 2005 the number of “partakers” had been declining, 70 years later it began to uptick. I noticed at the end of the service year ,2012 7 years later,that the annual worldwide reports which for decades appeared in the study edition of the WT were removed. These reports exist in the yearbook only. I believe that the increase of wheat like Christians who are waking up and are demonstrating the source of their “wheatness” (if I may coin a term) by publicly partaking?! We are sheep because spiritually we descend from the Lamb, we are wheat because of the seed that died was buried has risen and now produces,you guessed more wheat. When we partake we are essentially pledging our allegiance to that faith based process & God given gift! I just bought my Kosher wine! I am ready! sundown is still few hours away from where im located, and since last night I have been really feeling mixed emotions. I have done some readings and i am really feeling the horror in remembering the times i shook my head for ”NO” every time the emblems were passed in front of me…and there was also this kind of superstitious notion that Satan may tempt us to reach out and eat unworthily…i remember when i was a teenager, some folks would half-joke and say, ”keep hands tight together for Satan may also be in action..it’s just a stigma built up among the less informed witnesses in remote, rural areas..sorry but that’s what i can remember in my home cong in that small town in Asia..
so my point really is that, it’s scary to realize if i really let my mind process the fact that for years,i might have been unconsciously rejecting the blood and body of christ..i don’t know,but for some reason i wanted to feel better and justify the correctness of what’s conditioned in my mind, by reading again the WT teaching about why only the members of the anointed class are worthy to partake..and then the battle begins in my mind again and again..circling around it’s driving me insane..
Uggghhh i really thought I’m over this. Right now, i’m so conflicted and I know that in reality i would not want to appear stupid in front of everyone in that meeting place if let’s just say I would partake, that would surely raise everyone’s eyebrow since I haven’t been attending the meetings for a while now,..so it’s would be impossible for someone like me, a fader, not to mention my young age to be part of the ”generation” to just show up at a memorial and partake?..Well that’s another scary thing.. So i don’t know..I’m also not ready to do it alone..
sorry this sounds like venting..but i feel like im going to explode i can’t even focus with work..
First time posting here after some lurking about. Nice to see an UPBUILDING site like this of seekers instead of haters. After recently deciding to take some time off from meetings for deep research and prayer, I have decided not to attend tonight. The things I’ve been reading and watching have just made me question the organization more and more. As it’s only been a few weeks since my fade has become more decided, it would be a spiritual and emotional setback for me to go to the hall. I’ve moved and changed my contact details and am ready to go where the spirit leads me in my Bible studies for the first time in many years. I too feel conflicted about joining in the celebration at a hall or partaking at home. I haven’t had time to research the subject enough to feel I can make a balanced decision. I think I’ll be spending the evening in prayer and Bible reading and reflecting on the love of our heavenly father and his son. I’ll continue to pray for direction and humility. I wish you all a lovely Memorial season, whatever way you choose to honor Christ. Don’t worry too much. You do not have to partake at the KH. Not doing so does not mean that you have denied Christ before men. Just do it before. I had my own private reflection/celebration after sundown yesterday, which was technically the start of Nissan 14. Did I do something wrong? I sure do not think I did. My heart does not condemn me. Just celebrate at home if you want to. You do not owe the WTBTS any explanation. Today for the first time in my life I partook from the emblems in the presence of a full conference room in a hotel. I must confess that at first I felt the fear of man, and say fear of man because within myself something impelled me to participate. I prayed to my Heavenly Father for Holy Spirit and had the courage to do it before the eyes from some of astonishment and others displeasure, as was the case of the congregation coordinator elder. After partaking all the fear disappeared and I felt filled with a feeling of indescribable peace. No fear, just joy and peace and more to see that my wife also partook. My 20 years old daughter did not partake, but as my parents, who are living in Puerto Rico and are JW’s too, they asked us to have the Commemoration via telephone after I reach my home so they can partake, then my daughter and my brother in law partook. I am very happy and I know that many of those who did not partake in the KH tonight have done so at home and that’s excellent. Soon they will be ready to make public declaration from our union with Christ. Blessings to all. Good for you Jochy. The upward call is open to all and if we want to be saved then Jesus showed us the way in Matthew 26:26 where said, “Eat, ALL of you”. Also John chapter 3 and Eph 4:4 show there is one hope and one destiny that Christians have been striving for. I applaud you! I partook at home, this is my 2nd yr. my wife partook with me. A dear friend did partake at the hall,my hall we are study partners. Mt Zion mentioned at Rev 14:6 that your speaker may have mentioned, prior to this account is always here on earth, it reprents Jah’s presence and elevated rulership right here among mankind. This two hope doctrine,which the bible students adopted from the 2nd adventist movement, never refined, and had further corrupted through Rutherford, has created a group of people who can’t be identified as Christians in the New Testament sense whatsoever!! Are you still ” in “? How did you get your Wife to see TTATT? Or was it the other way around? I had my own memorial on Tues to honor Christ and accept his sacrifice for me. It was very freeing, because all these years, I also felt I was disrespectful and rejecting to not partake and fearful to partake because of the teaching of the WTBTS. I felt at peace and felt a completion to the rest of my dedication to Jehovah. That ” something” missing feeling is now, a complete feeling. Partaking felt so natural and all the fears disappeared, and in my heart I felt it was right before Jehovah. I felt I followed Jehovah’s and His son invitation on this one. This was my first time and will continue yearly to partake until Christ’s return. God’s Spirit is truly our helper . I see in Jehovahs Witness’s perhaps? the greatest potential for true Christianity to arise on a global scale. We have some profound and truly scriptural truths that I do believe,are great strides forward in relation to orthodoxy. The Trinity, the immortality of the soul, a mostly correct understanding of God’s kingdom. I believe this body of believers in the late 1800’s was attempting to free itself from the 1800-1900 yrs. of spiritual mixing and adulterating that the Catholic & mainstream Protestant movements had established. I believe that Satan being the predator that he is jumped upon this fledgling group of truthseekers early on. I believe that the pyramidology that Russell got entangled with may have been the door that opened up an influence with the enemy that corrupted our spiritual DNA very early on. I know this likely makes me a contrarion with the majority who engage in this forum,that’s fine. If a little leaven can ferment or change the whole lump, than it stands to reason that it’s converse or opposite should also be true. I’m currently working with a few brothers,one of whom has direct ties with the Bethel writing committee. I’ve opened his mind to the fact that we should all be partaking ,during the Lords evening meal, as all the Jews partook of the passover. Removing decades,or in many cases centuries of error is not easy!! The internet is filled with ex JW’s who are understandably angry. They’ve dedicated their time and energy towards discreditting the org. I understand that response as well. Frankly if I can’t be an agent for change from within, in time I will reconsider how to conduct my ministry elsewhere. But for now I know how to reach, struggling brothers and sisters who are in, how to carefully, often slowly expand their scriptural horizons beyond the 20 proof texts that they know. Please pray for me as I pray for all of you. My wife is on the same page as I, as I’m trying to get on the same page as God, that page being the over 31,000 verses in the divine text the Bible. What an encouragement it is to read your words! How exciting it is to hear that many have come to have their eyes opened! May Jehovah be with you and bless you. It would truly be something wonderful for a group of the faithful to be able to come together and read God’s word. I think I miss singing praises most of all. Bless you. When I attended the memorial last Tuesday,all I felt was sadness…it was an empty ritual, nothing to do with Jesus Christ…the speaker spent a lot ot time discussing paradise ,playing with lions and why we shouldn’t partake. The one encouraging thing was that I’d spent the weekend with my close JW friend and after long discussions,she’s now enlightened,researching and knowing her, I’m confident she will be fully awakened soon. I’m very happy to have three close family members,two close friends fully awakened ….one of the friends has in turn helped another friend awaken..the other friend plans to help one of her siblings. I feel that those who feel trapped in the organization can still be useful in awakening others,especially those close to them who already have doubts. unchained, i kind of felt the same. before attending, i was so restless and conflicted..but chose to attend because I have never missed a memorial my entire life..and i was just not ready to you know..
but when i got there..i don’t know..for the first time..it didn’t seem like the way it was celebrated made sense to me at all, that in fact, to my surprise, i whispered to my seat mate saying ”Are we really right about this stuff?” And she looked at me and God knows what she was thinking about me afterwards. I felt exactly the same last year, I couldn’t wait to get out of the hall. This year I went for the sake of my family, but right up to 5min. before we drove to the hall I was ready not to go. I was nice to see many of the brothers and sisters that I care about and the brother taking the talk is a kind and thoughtful man but the talk was empty, devoid of substance and felt meaningless. By the end I couldn’t wait to leave again. For me it was stitched together with the usual scriptures and sweeping statements. If I was a newly interested one I would have been confused by the talk outline but as we know the WTS machine will putty over the huge cracks so that the wall looks finished. We can only hope with Christ’s power that the putty falls out soon. It will be my last memorial attendance. I will partake privately as I did immediately after I got home this time. BTW..just did some readings. i found explanations of WT publications trying to prove that Judas was not part of the Memorial introduced by Christ since he already left before Jesus gave the new covenant. However, i see a verse in Luke that seemed like Judas was still there.that’s besides the point, anyway, the point im trying to say is that – with the way most of us not partaking at the Memorial, doesn’t that make us another Judas? Also, I made some thinking, and remembering JWs belief is that those who lived before Christ all have earthly hope, like Daniel, Abraham, etc etc..then maybe those meant the great crowd to live on earth, like the prophecy in Isaiah. then it could be possible that all who lived during Christ’s time and after until our time today are the ones covered by the New covenant. So that now, all that believes in Christ have to be born again, hope for heaven, part take at the emblems, until Christ arrives again…. so maybe there really could still be a 2 class hope, but not like the way JWs believe it would be. hmmmm..Just thinking out loud here.i would like to get your mature thoughts and understanding on this…help anyone please? I have come to realize that ALL Christians must partake! If you don’t then you are not a Christian, you must be something else. It’s not complicated at all! Jehovah must have purpose for the Earth but the whole fabric of the Bible is to do with the Jesus, and the heavenly hope offered to men & women among mankind to form a righteous government. “Many are called but few are chosen”, so our desire should be to live for our Master and not be governed by fear of men. How world events play out is largely secondary as the restoration of Earth and it’s subjects under Jesus Kingdom can only be accomplished by His direct rule. The primary goal is for a Christian to be exactly that – a follower of Christ! So if you are a Christian you must partake, as a sign of obedience and remembrance. Anything else is a snub. There is no room for observers. those who partake without considering what they are,(sinners)are normally sickly and are sleeping in death. and of course read all about the G B.and the take over from Russel. I applaud you for striving to live by scriptual truths and I may typically as myself be missing the point. I have seen many refer to laws set by the society or the bible. Let me direct you firstly to Jehovah’s principles by which all things are measured, not the laws. I feel Continuing to focus on the little pedantic things the Society does prevents us from truly gaining spiritual maturity. The last few pages of Bro Frans book was the same conclusion I had been fortunate to perceive 15+ years ago. Looking at Jehovah being the God of love and this being the primary fruitage, understanding and living for this principle fruitage frees us to worship as gods children with free will and in truth. All else pales as petty and distracting to me. Recently my youngest had a birthday. We of course had no party, and that’s not something I have ever experienced anyway, nor has she. But this is the first time I ever really had a longing to celebrate it. Even several years ago, long before I had read “the books that cause the struggle” and become enlightened to the facts we discuss here, it bothered me. WHY don’t we do birthdays? WHY don’t we do Mother’s Day and Father’s day?